Okay, so I'm a little behind on this one because I havn't checked my Google Reader in a while. Something very exciting is happening over at the Nester's blog. 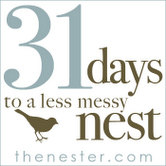 31 days, 31 inspiring posts. And the best part? She has some other crazy talented blogging women taking the journey with her and they are all exploring the theme in a different way. So sorry that I'm getting this info out late, but I wanted you to know. There are some talented ladies putting out some pretty stellar posts this month and I can't wait to learn from them ~ 31 days to a better photo anyone?